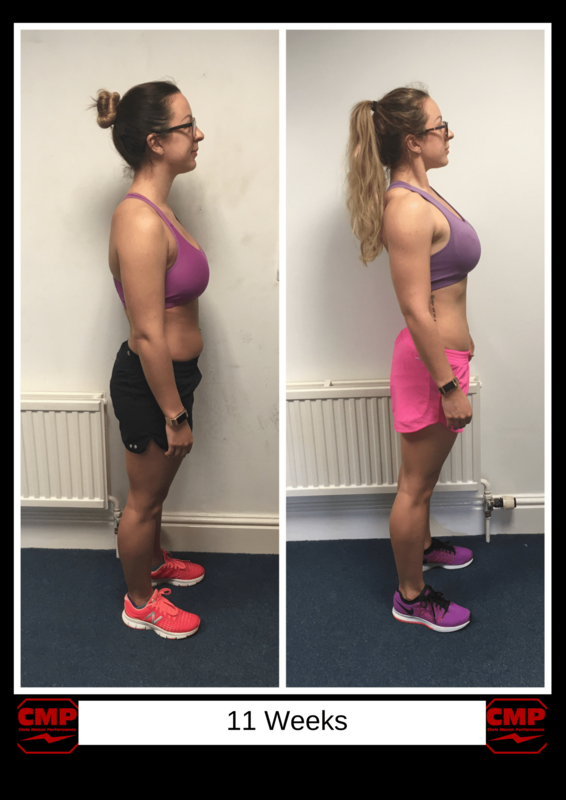 Like many clients who walk through the doors of CMP, Gemma had a goal that she had been struggling to achieve despite exercising regularly and eating well. Also like other CMP clients, she had invested money into trainers, gyms, classes but still hadn’t quite seen any sort of return. 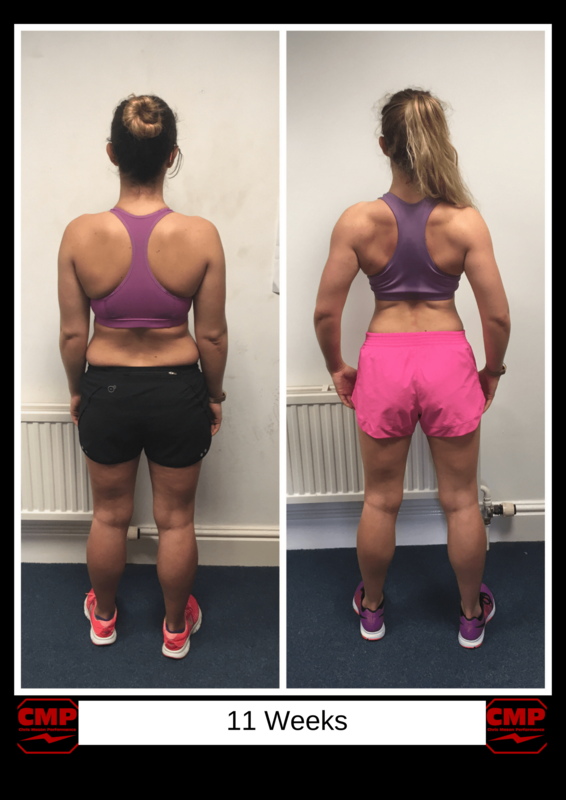 Here’s what Gemma has achieved in just 11 weeks of our Body Transformation Program. 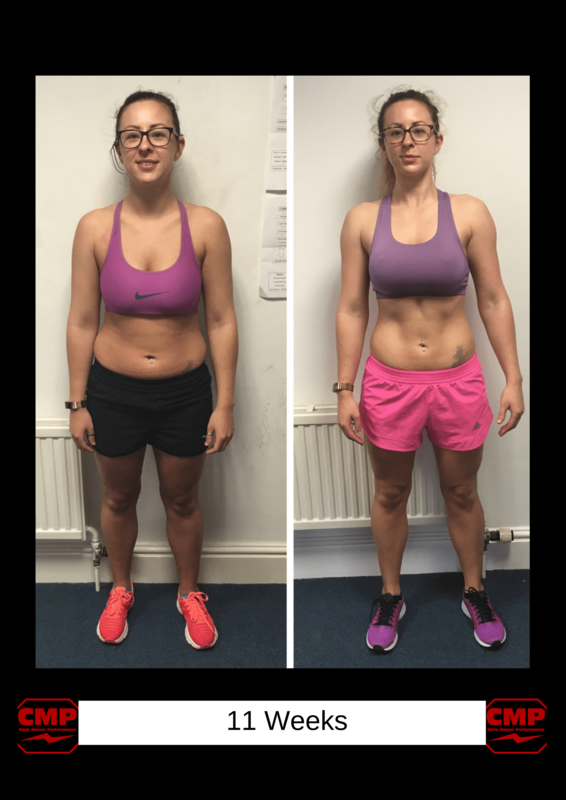 Firstly, well done on your amazing transformation, the difference in your physique is pretty impressive, how do you feel? Great, I feel a lot more confident and happy with my body. I feel fitter in general and I can now do a lot more strength based moves in my pole fitness classes and don’t feel as conscious about my body when performing in a mirrored studio! You were already exercising a lot before joining CMP, what difference did our body transformation program make to your fitness and shape? Fitness wise I’ve noticed that I have way more stamina and more endurance and shape wise I have completely changed. I’ve got leaner which is very noticeable in clothes and I am seeing muscle definition that I wasn’t seeing before. People have noticed that my shape has changed and are always asking me about how i’ve achieved it! Why did you choose CMP? From the amount of testimonials and transformations that I had seen on facebook I was also following the articles that were posted and to me I meant that I had trust in that you knew what you were talking about. I had previously paid personal trainers for sessions who didn’t deliver on my goals and didn’t have a plan or explain anything to me which left me feeling like it was a waste of money and I could have done it myself. I really wanted to learn how to lift weights and through the body transformation program I have become stronger, been taught how to lift and am now lifting weights I never thought I could have! In just the last three months we’ve changed your style of programming and nutrition three times that has meant you’ve made pretty rapid progress. What have you learnt throughout the process? Not just for improving how I feel but also how I feel, it makes sense when you say that your body is an engine that has to be fuelled properly. I feel confident I knowing how to stay in shape for life now and the nutritional plan is much easier to follow than you thought it would have been. I was weighing and measuring my food before, where now I just know what I should be eating and how much without having to keep a scale with me! Beyond the physical transformation, have you noticed any other benefits? I think it is a mental transformation too, especially if you have struggled accepting your body and struggled with food. I can say that I used to eat through boredom before whereas now I don’t and especially working from home I have learnt not to keep going to the fridge. I also used to smoke and food had replaced my habit but now I feel confident in keeping to good nutritional habits without binge eating and without boredom eating. What would you say to anyone thinking of joining the CMP body transformation program? If you’re thinking about it, you’re probably ready to do it. It is only you that can change your body, so bite the bullet and do it. Chris and his team are 100% worth the investment and will be able to help you achieve way more than you thought possible!